So out of the 2,000ish hikers taking off on the A.T. this year there are probably 200+ blogs that tell their story. Most of them are a daily log of which road they crossed, daily mileage and when they had been rained on. We are trying to do something with a bit more content to give our readers a broader perspective on what we are doing out here in the woods. Now that we have our first couple weeks under our belt we are starting to see some of the ways our approach is different from our hiking peers, and one of the biggest differences is that of nutrition. Ramen noodles. We are on a ramen embargo and plan on staying on it for the next 5 months. Lindsay has a mild allergy to gluten and Clay is the 220lbs pack mule who needs more than 190 Calories of ramen for dinner. Since we also claim to be professionals in the fields of sports training and sports nutrition (it used to be Lindsay’s job and will be Clay’s grad school focus) we should have a leg up on a proper nutrition plan to prevent fatigue and long term injuries. So since ramen, Easy Mac and instant pasta are all but out of the question for Lindsay, we have been eating much more variety than our evening shelter-mates. Many books and guides claim that food should be “lightweight and durable, ‘cooking’ is adding hot water to something … to make it edible. Hikers cherish the opportunity to eat real food” (quoted from one of the best selling trail memoirs). I disagree. I’ve suffered enough in the woods carrying packs 3x the normal hiker weight to know that food=morale. I see it around us in camp at night when others are trying to swallow dehydrated potatoes for dinner or cooking another block of ramen before sleep because they don’t want to be starving at bed time. They are out here surviving not thriving when it comes to a nutritional sense and it clearly effects their morale. Finding gluten free grain sources is only a small hurdle compared to the very difficult job of getting enough protein on the trail to actually enable the body to recover from the day’s activity. This prevents the downward spiral of the body cannibalizing itself as the weeks go on, something all too common in Ranger School. To prevent this we try to have a protein source at every meal; at breakfast it is often peanut butter, lunch is a mix of high protein sports bars, beef/buffalo jerkies and trail mix with dinner often having a packaged or canned (heavier, so less desirable) meat source mixed in. Close up of Clay cooking some breakfast while still in Georgia. 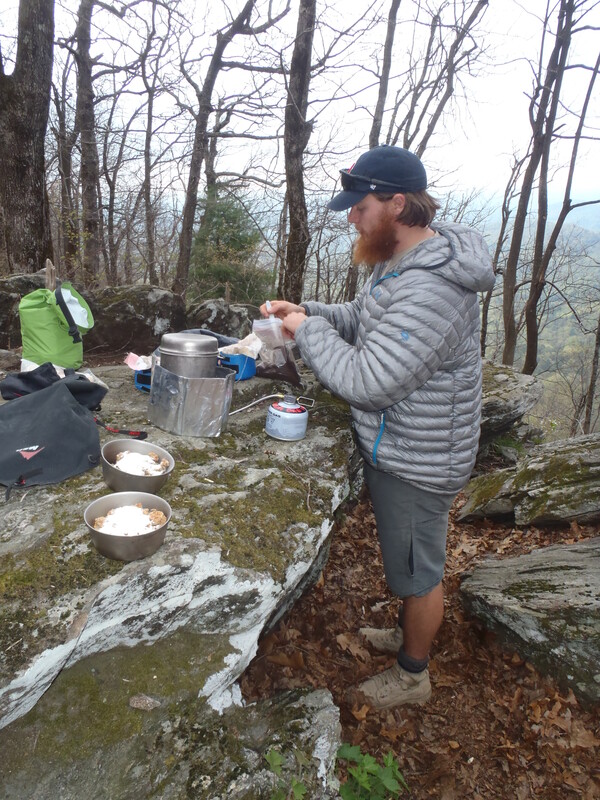 Our evening meal is where we get gourmet by hiker standards, consisting of either a quinoa, rice or whole wheat pasta base with dehydrated veggies and canned/packaged tuna or chicken. We try to incorporate some variety into our lives by adding a flavoring packet into the mix. Sometimes its taco powder or chili mix, sometimes we make homemade chicken alfredo with powdered mix and sometimes we get exotic and put in a Thai or Indian curry! 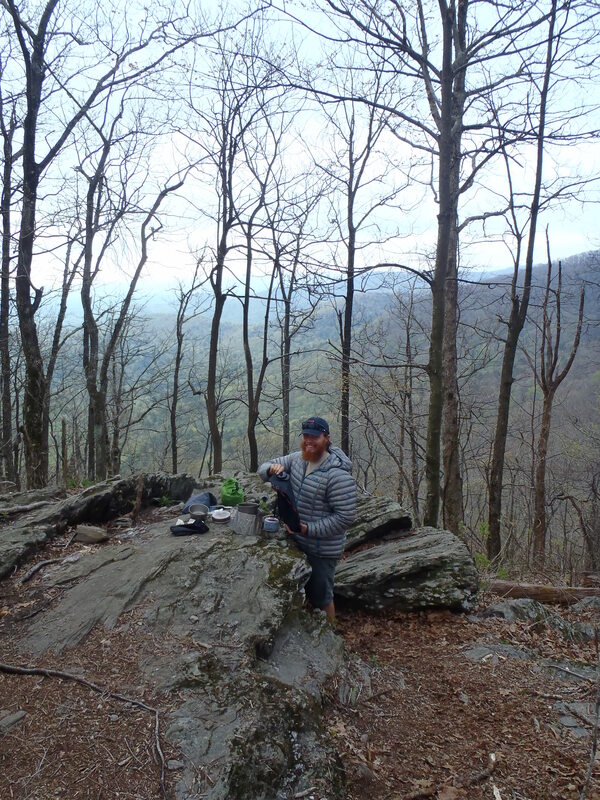 In one of our previous planning posts, Appalachian Trail Prep III, The Food, we outlined our expected eating schedule and so far have been sticking too that quite closely. From what we have been told, the first two weeks is when people break down the fastest, take the most town day and have the shortest miles. So far we have been walking more then expected and feel great, minus the expected blisters and bruises, and feel a lot of that is due to having a good nutrition/recovery plan to start. This is something I plan on hitting every 4-6 weeks as we go to let you know how the hiker hunger is going! I am thoroughly enjoying your blog so far! Thank you for the detailed extras like nutrition and gear that you are providing. I hope to be a thru hiker in 10 years…when my last child will graduate high school. I’ll be 52. Can’t wait. Until then, I’ll hike vicariously through blogs. I too, am a health and fitness concious person. I look forward to continuing to read your blog and the tips I’ll pick up!